Heinrich Oaken-Hull, a Nord pirate, is a captain and shipmaster residing in his hometown Anvil while his ship is being refitted. He is married to Hasathil, a Bosmer, and this unusual relationship is a regular conversation topic amongst the townsfolk. Heinrich has a close friend in town; grouchy harbormaster Newheim the Portly. He and Newheim have a rivalry towards another group of friends, led by local musician Jesan Sextius. Unfortunately, Heinrich spends so much time with Newheim, he never even realizes that his wife is cheating on him with Enilroth, a young blacksmith, but on the surface, the marriage appears to be fine; Heinrich and Hasathil both sleep in the double bed in the upstairs area until 6am and they always start the day with two hours of relaxation on the ground floor. Starting at 8am, Heinrich will just walk around the docks, occasionally speaking with the other pirates. He will do this all morning and afternoon, only interrupted at midday when he will take a two-hour lunch at The Flowing Bowl. At 6pm he returns to the dockside tavern and eats a two-hour dinner until he finally heads back to his house and wife for a bit of wandering before his bedtime at midnight. He breaks off this routine at 7pm on Tirdas and Turdas when he visits another good friend of his, Countess Millona Umbranox in Castle Anvil, and participates in her formal dinner until 11pm. There is a slim chance that any time he's not eating or sleeping, he'll seek out Newheim for a surprise visit. He wears a set of ordinary middle-class clothing, a brown shirt with a pair of light brown linens and pigskin shoes. He carries his house key and a small amount of gold. Obviously more obliging than the other pirates on the dockside, he will politely introduce himself: "Heinrich Oaken-Hull, captain and shipmaster. My ship is in for refitting, so I'm high and dry for a while." When asked about Anvil he will reveal to be quite dissatisfied with the situation: "Anvil wouldn't be my choice for a refit. No proper yard, neither spars nor scantlings in good supply. But, it's ill-luck to complain." A Nord and a Bosmer in holy matrimony is rarely seen and the Anvil citizens will scoff and make comments such as "The shipmaster, Heinrich Oaken-Hull, has a wood elf for a wife. I'd rather sleep with my horse. 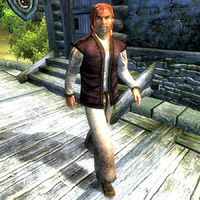 ", "Heinrich Oaken-Hull is married to a Bosmer? I suppose the women are less annoying than the men. ", "You don't see a lot of Human-Bosmer marriages. I don't know if it's even legal in Cyrodiil." and "I don't know what would possess him to do that. Marrying a Bosmer is just wrong." He was apparently one of the victims of the Sirens gang, as his pants, shirt, shoes, and family heirloom can be found in the basement of Gweden Farm during The Siren's Deception. These items cannot be returned to him, however. Heinrich's dialogue as seen in subtitles includes the line "My ship, the Serpent's Wake, is in for refitting, so I'm high and dry for a while." but as delivered in audio, the line leaves out the name of the ship, becoming simply "My ship is in for refitting, so I'm high and dry for a while." This would seem to indicate that the developers had spotted that the captain was already dead but didn't fix everything.